As the days get shortened and the day light limited, my energy sinks to an all time low. Everyday at 4:30, I look out of my window and see the golden light of the setting sun, an obvious sign that another day gets ended. It gives me joy and makes me sad...yes all at the same time. Am happy as this certain not to be missed nip in the air means my favourite season is setting foot in my part of the world. but am also sad as am not much able to go out and enjoy this beautiful weather or the festivities it brings on with it. Its just a wait that makes me anxious, happy and giddy all at the same time. But will share that story some other time! 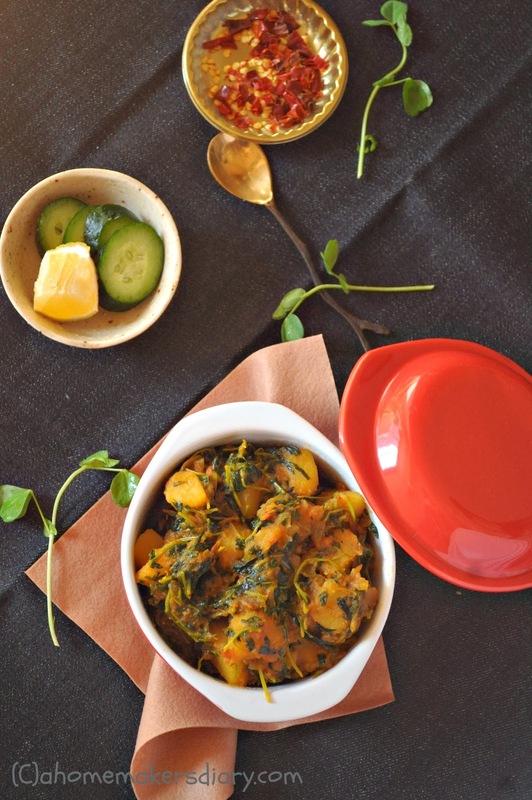 The recipe that am sharing today captures the essence and flavour of winter perfectly. It has that kind of aroma which reminds me of my growing up years. When on return from my school or Collage would sniff the air to check if Maa has cooked these greens. It will make me hungry for lunch and will pester around her to sit for lunch asap. For many reasons I was taught to be responsible from a very early age. and by that I no way mean the responsibility of myself but of others as well. When I was in standard 9 I had to take care of a whole household, whenever my mother went out for her work. Before starting my studies I had to instruct the maids, the cook for the days chores and menus. i had to look after the daily groceries, kid brother's snack box and everything that my mother had to do when she was around. It was in one such days when I first tasted these methi leaves and was bowled over by its amazing flavour. I had no clue how to cook it then and the fact it was not a very regular greens around the place I lived, no one could help much. Called up my grandma and she told to pair it with potato or something neutral in smell to let the flavour of methi leaves flourish. I cooked a simple stir fry of potato and these greens and loved it with a regular rice-lentil meal(see that simple recipe in the notes section). The flavour has something that makes you hungry, that makes your eating a beautiful experience. There is something in these that I could never turn my back whenever I saw them in the market. In winter my kitchen always have a couple of tiny bunches of these in ziplock bags. I add them in almost everything, I flavour my rotis, Alu Paratha, theplas, paneer curry. potato curry, dal and what not. Just in case you have a green thumb let me tell you that growing methi is the easiest. You can grow it all round the year. 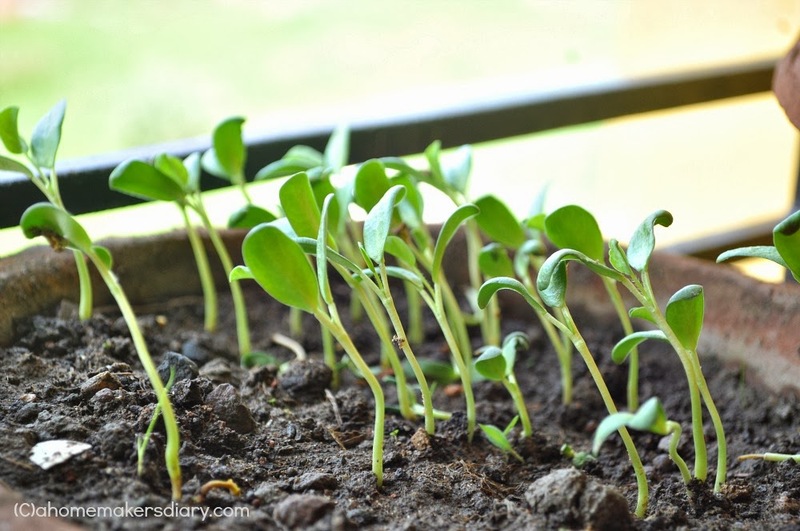 Just soak some seeds overnight and sow them in a pot in the morning. Place the pot in a well lit airy space and you will have Methi greens in no time. Actually they are ready to be harvested within 2-3 weeks. 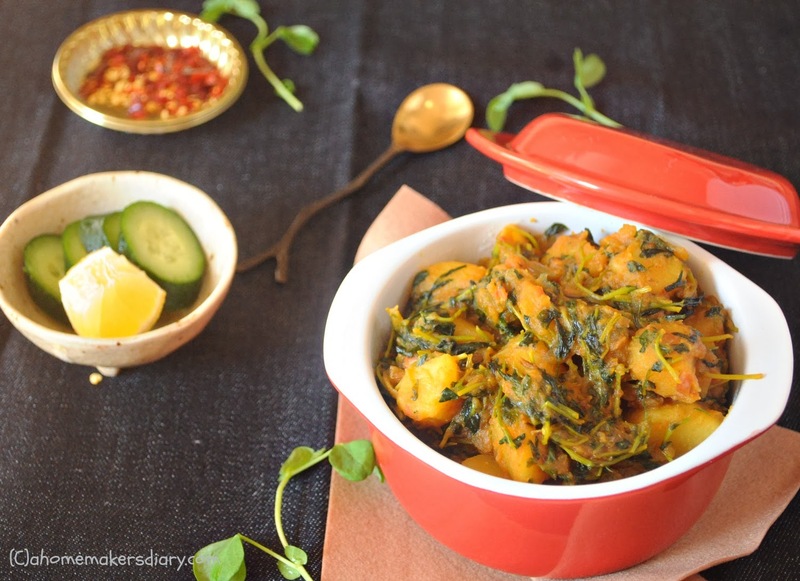 I always have a pot of methi growing in my balcony and it does wonder to add flavour in any dish. 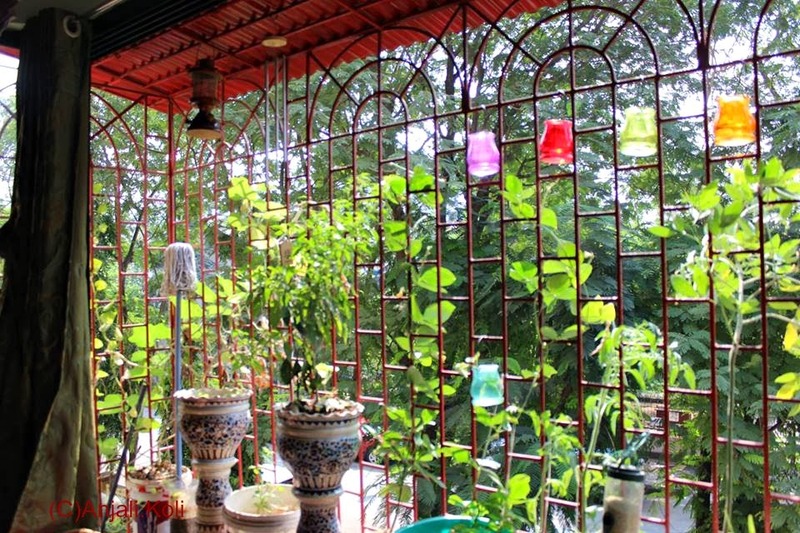 just to inspire you here is one awesome Balcony garden or as she calls it her green window box. Check out Talented Anjali's post on how she grows amazing things in a small Balcony in Mumbai. For me its very very inspiring. Here is my simple yet very very comforting recipe for Methi-Alu. Cook and eat it fresh with Roti or Rice and lentil for a warming wholesome meal. Peel and cut the potatoes in medium size cubes. keep aside. Peel and chop the onion very fine and keep aside. If you are using purple onion, you can even make a paste and use it. Pick, wash and clean Methi leaves. If the stalks are very hard which is generally the case for store bought Methi greens better to discard them. Its very chewy. Check by folding the stalk if it snaps and breaks use it in the curries but if its very thick and hard chop it off. Chop the tender stalks and leaves finely and keep aside. Heat the oil in a kadhai or a heavy bottom pan, I generally use non stick or hard anodized utensils. Lightly saute the potato cubes with a pinch of salt till golden. Take out with a slotted spoon and keep aside. Add the fenugreek seeds in the same oil and let them release their aroma and turn dark brown then add in the chopped onion and fry on low till you see the sides becoming brown (3-4 minutes). Mix in the ginger paste, coriander powder with 2 tbsp of water and add in. Fry till oil starts to separate. Finally add quartered tomato, salt, turmeric, chili powder. mix and cover. Let it get cooked till the raw smell of the tomato is gone and its mushy and mixed. Please wait till spots of oil starts to appear on the sides before adding the methi greens. Mix in fried potatoes, methi greens to this spice mixture and cook on medium flame. The greens will release a lot of water which the potato will soak and get cooked in. Be patient and cook gently, as you dont want to end up with a mush of potato and greens (that tastes great too by the way). Adjust the seasoning and continue cooking till the potatoes are tender. Till date I never had to add extra water, but if your greens are not fresh enough you might have to add little water to it. Add 2-3 tbsp at a time till your potatoes are cooked. 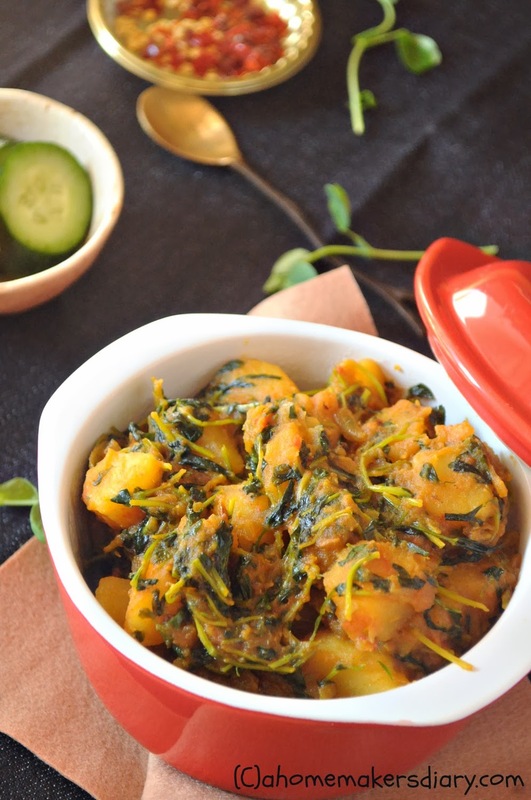 The end dish would be a dry curry with tender potatoes and greens sticking to each other. Serve hot and fresh just from the wok for a satisfying meal. 1. Like any other greens when cooked covered it looses its bright green hue. If you want to retain the colour then do not cover the pot once you have added the greens to it. 2. If you dont wanna travel the curry route and saute your spices just go fr a simple stir fry. Fry methi seeds and green chillies, followed by chopped onion. Once its lightly fried (a minute or so) add little thicker than matchstick style potato pieces and chopped methi leaves. Adjust salt turmeric and fry on medium till you get a dry stir fry kinda dish. If the leaves release lot of water, crank the heat to high and dry it or the potato will be overcooked. Finish with a dash of lime juice if you like. I love methi but do not use thi herb as much as my mom and aunts use it. I too like alu methi combination. Curry looks delicious! Yummy looking aloo methi...true it is so depressing to see the sunset early.Anjali's garden looks so beautiful wish I had one here. Darun...Alu methi looks fabulous. Bhison flavorful hoi ei dishta. Tomar garden ta amar khub sundar. Winter is my favourite season as well. This is the time when all the vegetables are fresh. I am sure your aloo methi must have tasted superb.Loved the look of it as well. One of the most yummy combination in vegetable. Loving it. tomar dewa recipe gulo dekhe most of the time ekta loombaaa nisshas beroy keno ama bujhte parcho asha kori..